Acro combines elements of acrobatics, yoga, and dance. It is a joyful expression of strength, flexibility and communication between 2 or more people. And it’s fun! In the summer, our community meets at the Farmer’s Market. 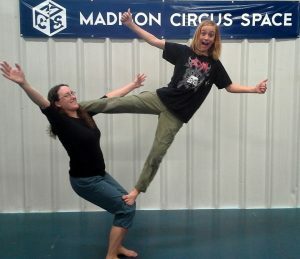 But, from November to April, we’re moving indoors to the Madison Circus Space, 2100 Winnebago Ave.
What: Open Acro Jam. All levels and ages welcome. Children must be accompanied by adults. No formal instruction provided. However, we are always willing to get a newcomer started. Cost: $5 for non MCS members. Free for MCS members. Please read these great etiquette guidelines and the safety policy below and come with an open mind and a willingness to explore! Everyone must sign a waiver each calendar year. Communication is key! If music is played, make sure it is at a low volume. It’s vitally important that spotters, bases and flyers can hear one another. Work within your safe skill-range. It can be tempting to try the big tricks before you’re ready. Don’t do it! We want you to be challenged. But, we want you to be safe. Use spotters! If you’re working on a new, challenging, or dangerous move, use spotters. Use crash mats when needed. We understand that there are times when crash mats will actually make things more dangerous (dynamic moves where the base needs to be able to move quickly, or spotters need to be able to move in circles around the base). But, if you’re working on a dangerous trick that would benefit from a crash mat, use one. Wear appropriate clothing – snug-fitting, non-slippery, easy-moving clothes work best. Remove any bling that could cut or injure your partner. Hosts can ask participants to stop any move they deem unsafe. People who the hosts consider dangerous to themselves or others may be asked to leave. For more information contact Deanna Schneider or Stephanie Richards.